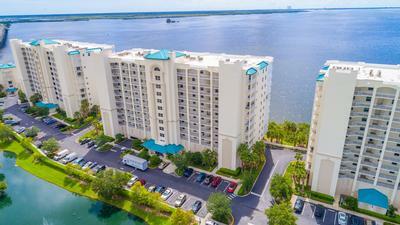 Beautifully maintained condo home with direct Indian River views from the great room, kitchen and master suite. Features include large balcony with electric storm shutters, separate laundry room, breakfast room, tile floors though living area and baths, attractive wood laminate floors in all bedrooms, walk in closets in every bedroom and a private under building garage. Many tasteful decorating choices include plantation shutters, professional custom paint, stylish kitchen tile back splash, tile kick plate at breakfast bar, ceiling fans and updated bathroom lights and mirrors. Pristine condition. Harbor Pointe has resort style amenities to include pool, clubhouse with sauna and fitness center, basketball and tennis. Close to restaurants, shopping and easy access to Orlando. Offered at $339,900.